August the 7th , 1645 by Bishop Balaguer Camarasa when he consecrated it with two other new bells for the Cathedral church. The second oldest in the cathedral used to hang in the south west tower and was used for the quarter strike of the clock. This fine bell is dated 1499 and was cast by Master Antoninus in Tortoreto on the Adriatic coast in Italy. This bell was replaced by a newer bell, since it has suffered severe damage. 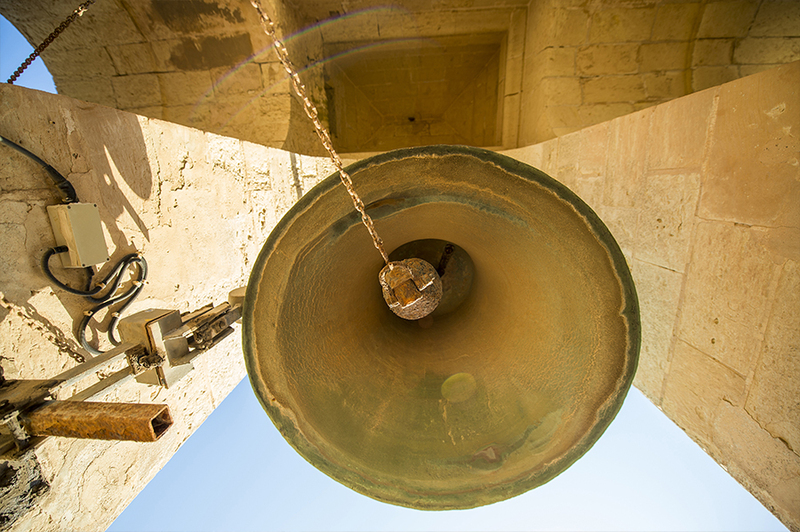 The other clock bell was cast at the Foundry of the Order in Valletta in 1616 and is still used for chiming the second quarter of the clock. It carries an effigy of St. Paul and the coat-of- arms of Mdina. In 1633, another two bells were cast for the Cathedral. These replaced a big cracked bell and two small ones which were recast. The larger of these new bells remained the largest in the towers until 1958, when a bigger bell was cast. In 1727, a medium sized bell was ordered in Messina. 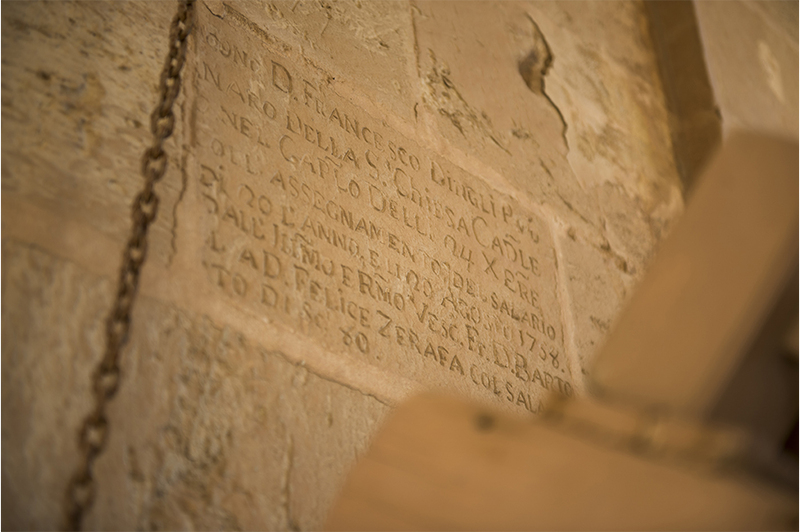 The bell is beautifully decorated with two round medallions, one of the Virgin and child while another with St. Paul, carrying the cross of faith intertwined with a viper which was also the cause for the Maltese to immediately believe in the Christian faith. 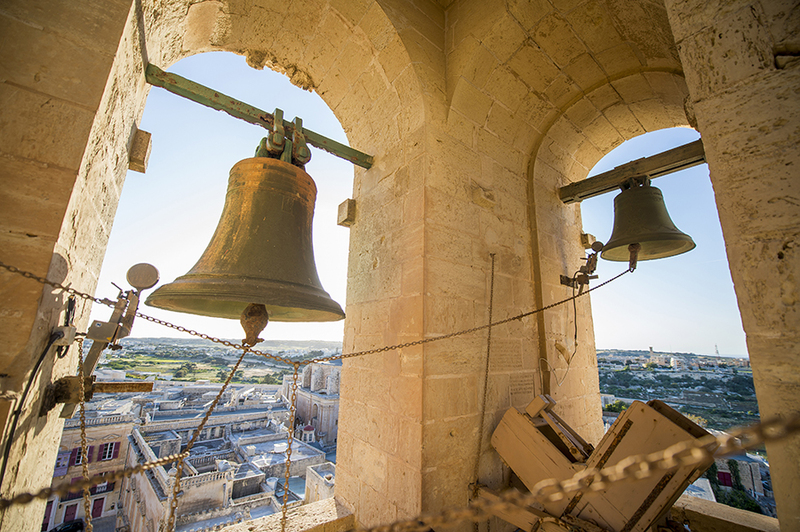 In 1958 two bells were again cast for Mdina Cathedral. These were made in Milan at the Prospero Barigozzi Foundry. The larger bell was inteded to incriment the number of bells of the Cathedral, while the smaller was inteded to replace an older bell. Both are beautifully decorated and have a very good musical tone. The larger of the two is decorated with the image of the Assumption of the Virgin, an effigy of St Michael after the Archbishop’s name who ordered the bells, Mgr. Michael Gonzi, as well as his coat-of- arms, all of which are in relief. The smaller is dedicted to St. Publius and has a relief of the saint and a crucifix on the other side. The latest addition to the Cathedral bells is a bell cast at the Paccard Bell foundry of Annecy in France which was made in 2016 to replace the older 1499 clock bell which had sustained damage and which is placed in the Cathedral Museum on display along with the oldest 1370 bell.